What Are the Dangers of Royal Jelly? Why Shouldn't Babies Eat Peanut Butter? Peanut butter is a nutritionally-dense food that's popular for its texture, taste and adaptability to a range of dishes. Despite being a healthy way to add daily protein, vitamins and minerals to your diet, eating peanut butter isn't free of potential dangers. Due to their poorly-developed digestive systems and the potential for having undetected allergies, babies may be particularly susceptible to the potential dangers of peanut butter. In addition to its taste and nutritional benefits, peanut butter owes much of its popularity to its thick, sticky texture. While older children might enjoy this aspect of peanut butter, babies and children under the age of 2 may have difficulties dealing with peanut butter because of its texture. Due to the difficulties associated with swallowing peanut butter, it may present a choking hazard to babies and young children. Instead of giving your child large amounts of peanut butter, mix small amounts with applesauce to make swallowing and digestion easier. If you have a family history of peanut or other food allergies, your baby might be sensitive to peanut butter. To be on the safe side, determine if your child is allergic before introducing peanut butter into her diet. While allergy testing can be performed on infants as young as 4 months, these tests are both difficult to perform and somewhat inaccurate at such young ages. 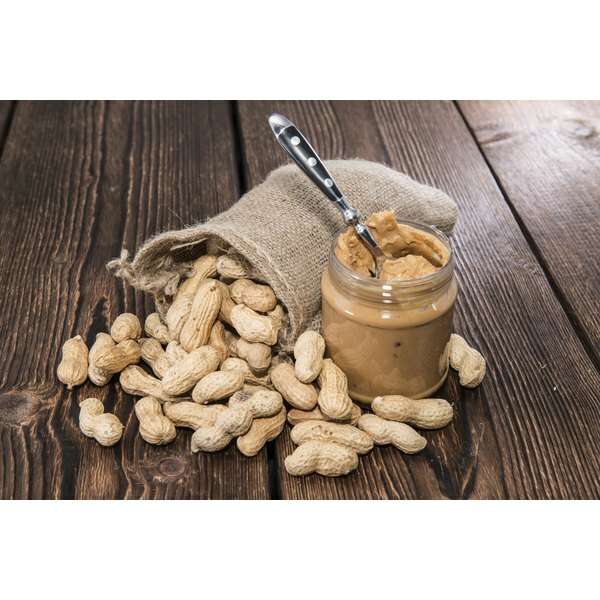 A combination of allergy testing and monitoring your child's reactions to peanuts may help you to determine if and when she can be given peanut butter. Even if your child doesn't show symptoms of food allergies, exposing her to peanut butter may be dangerous before her first birthday. While small amounts of peanut products may not be problematic, a team led by Adam Fox of King's College in London found that large amounts may contribute to the development of a peanut allergy. In their 2009 study, these researchers found that children of families who eat a lot of peanut products, particularly peanut butter, are more likely to develop peanut allergies in their first year of life than other children. When is Peanut Butter Safe? Allergic reactions in young infants can range from mild to severe, with common reactions including rashes and respiratory problems. The allergens in peanuts are very potent and can trigger allergic reactions in babies when touched, eaten directly or consumed indirectly through a mother's breast milk after she eats peanut products. Despite the risk of allergic reaction, recommendations for when your child can have peanut butter have become less strict in recent years. Based on a 2008 review of the research on food allergies in infants, a team led by Dr. Frank Greer of the American Academy of Pediatrics recommends that peanut butter is safe after the age of 6 months. Due to the difficulties associated with swallowing at such young ages, however, it is still considered a choking hazard for children under 2 years of age. When Can Kids Eat Nuts?